Quickly following what many expected to be a wholesale revolution in library practices, institutional repositories encountered unforeseen problems and a surprising lack of impact. Clunky or cumbersome interfaces, lack of perceived value and use by scholars, fear of copyright infringement, and the like tended to dampen excitement and adoption. This collection of essays, arranged in five thematic sections, is intended to take the pulse of institutional repositories—to see how they have matured and what can be expected from them, as well as introduce what may be the future role of the institutional repository. Making Institutional Repositories Work takes novices as well as seasoned practitioners through the practical and conceptual steps necessary to develop a functioning institutional repository, customized to the needs and culture of the home institution. The first section covers all aspects of system platforms, including hosted and open-source options, big data capabilities and integration, and issues related to discoverability. The second section addresses policy issues, from the basics to open-source and deposit mandates. The third section focuses on recruiting and even creating content. 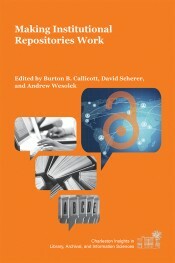 Authors in this section will address the ways that different disciplines tend to have different motivations for deposit, as well as the various ways that institutional repositories can serve as publishing platforms. The fourth section covers assessment and success measures for all involved—librarians, deans, and administrators. The theory and practice of traditional metrics, alt metrics, and peer review receive chapter-length treatment. The fifth section provides case studies that include a boots-on-the-ground perspective of issues raised in the first four sections. By noting trends and potentialities, this final section, authored by Executive Director of SPARC Heather Joseph, makes future predictions and helps managers position institutional repositories to be responsive to change and even shape the evolution of scholarly communication. "Making Institutional Repositories Work sums it up very well. This book, the first of its kind, explains how IRs work and how to get the greatest results from them. As many of us know, numerous IRs launched with high hopes have in fact languished with lackluster results. Faculty have little interest, and administrators see little promise. But the many chapter authors of this very well edited book have made their IRs successful, and here they share their techniques and successes. This is a necessary book for anyone contemplating starting an IR or looking to resurrect a moribund one." "This volume presents an interesting cross-section of approaches to institutional repositories in the United States. Just about every view and its opposite makes an appearance. Readers will be able to draw their own conclusions, depending on what they see as the primary purpose of IRs." "Institutional repositories manage and provide access to the results and products of research. And, when networked, repositories collectively represent a key component of the evolving global open science infrastructure. As the momentum for open access grows and universities take on greater responsibility for managing their research outputs, the role of repositories is, equally, gaining in importance. This book provides a valuable overview of the current trends in institutional repository services and offers helpful guidance in terms of addressing challenges and adopting best practices from key North American experts in the field." "Whether your IR is new, you are new to an IR, or you want to learn how other institutions are successful in specific areas, Making Institutional Repositories Work offers valuable and practical guidance. Each topic is addressed from multiple angles, as 39 authors share a range of varied experiences with selecting platforms, adopting policies, recruiting content, understanding metrics, and more. All readers are likely to see their own academic library within these pages. Making Institutional Repositories Work is a book I wish had been available when I launched an IR a few years ago." "Making Institutional Repositories Work should be required reading for any librarian involved in the establishment of an institutional repository. Covering fundamental topics such as platform selection and policy creation, this book can help new repositories start with a clear plan for success. It will also be a welcome addition to the shelves of seasoned IR managers, as its thoughtful thematic sections and case studies provide real-world approaches to assess, sustain, and improve repositories on any campus." "Approaching this volume as one of 'those of us who have been furiously working to cultivate thriving repositories,' I am very excited about what this text represents. It is a broad compilation featuring the best and brightest writing on all the topics I’ve struggled to understand around repositories, and it also marks a point when repository management and development is looking more and more like a core piece of research library work. Callicott, Scherer, and Wesolek have pulled together all the things I wished I’d been able to read in my first year as a scholarly communication librarian. 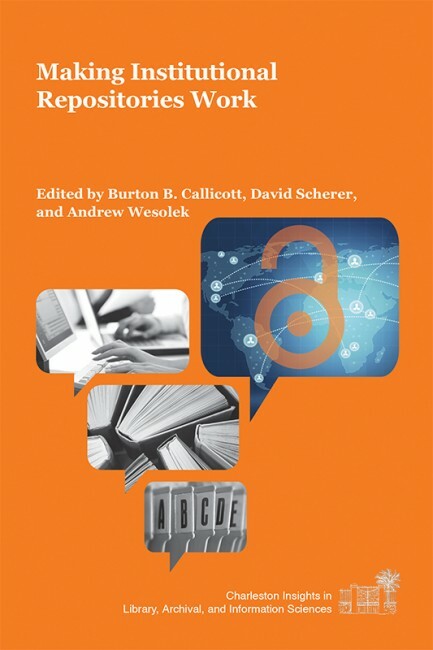 As I tweeted while reading a review copy: 'To my #scholcomm colleagues—the forthcoming Making Institutional Repositories Work will be essential.'" "This is a useful book. The authors understand both the promise of institutional repositories and the real-world obstacles to fulfilling that promise. All who are charged with maintaining repositories will recognize these opportunities and obstacles, and welcome the chance to listen in as voices of experience talk through what has worked and what has not, even when not all voices agree on all details. Repositories are a mature method of delivering open access, and they're here to stay. We've made enough progress to have refined our first thoughts about best practices. But we still have further to go, and our best bet is to listen to the kinds of shrewd and informed people speaking in this book. There are very few questions more important to the future of knowledge-sharing than how to make institutional repositories work." "Librarians involved in scholarly communication, repositories, open access, research data management, and assessment of those areas will have much to learn here. A must for nearly every academic and research library." "This edited work functions very well as a detailed manual for the staff of library systems planning on building or rejuvenating a digital repository for their institution. Summing Up: Recommended. Researchers/faculty; professionals/practicioners." Burton B. Callicott is a reference librarian at the College of Charleston, where he is cochair of the institutional repository committee and oversees faculty contributions, training for faculty/student access, and manages workflow. David Scherer is the assistant to the dean of libraries at Carnegie Mellon University. Previously, David was the scholarly repository specialist with the Purdue University Libraries. In that role he oversaw Purdue’s primary institutional repository, Purdue e-Pubs, and educated faculty on open access and author rights, new models of publishing, and opportunities for open access publishing. Andrew Wesolek is the head of digital scholarship at Clemson University. In this role he leads the university’s scholarly communication outreach, education, and infrastructure initiatives, including Clemson’s institutional repository, TigerPrints.